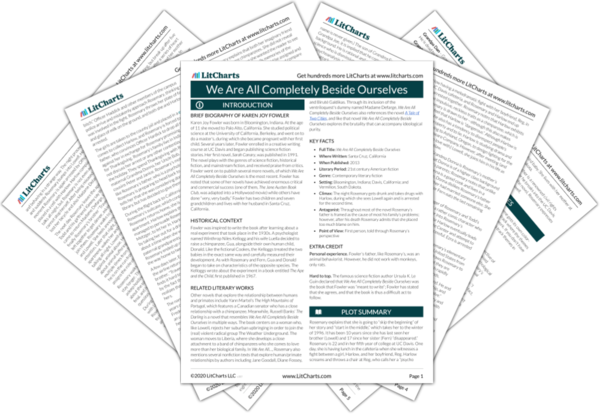 Instant downloads of all 946 LitChart PDFs (including We Are All Completely Beside Ourselves). LitCharts assigns a color and icon to each theme in We Are All Completely Beside Ourselves, which you can use to track the themes throughout the work. Both Rosemary and Lowell suffer from the burden of Fern’s disappearance and their mother’s breakdown, and at times Lowell is kind and sympathetic to this little sister. He occasionally lets Rosemary come and sleep in his bed, just as Rosemary and Fern used to climb into their parents’ bed in the middle of the night. Lowell’s room smells of the cage where he keeps three pet rats given to him by his father’s laboratory. In the mornings, Lowell leaves before anyone else in the family is up. Rosemary later learns that he has breakfast with a devoutly Christian, childless couple, who—like almost everyone in Bloomington—know something about the “situation at our house.” One day, the wife knocks on the Cookes’ door and gives Rosemary some cookies, telling her to remember that she was made in God’s own image. The narrative focuses on Rosemary’s feelings of isolation, but there is evidence that Lowell is feeling isolated and lonely too. Like Rosemary, Lowell reacts to Fern’s disappearance (and the subsequent breakdown of the family) by withdrawing from their life at home, choosing to spend time with friends and even a random Christian couple from the neighborhood. Rosemary never explains why Lowell is drawn to the couple, but it is possible that Lowell seeks them out because of the stark contrast they provide to Lowell and Rosemary’s father, an atheist who treats science as a kind of religion. Rosemary notes that the reader probably assumes Fern is dead, but that she is in fact still alive. Rosemary can’t remember her parents telling her anything about Fern’s disappearance. Lowell sees a counselor, Ms. Delancy, who suggests various activities for the family to participate in together. This infuriates Rosemary’s father, who rejects psychoanalysis as unscientific and “bogus.” Rosemary, meanwhile, gets a new babysitter, a college student called Melissa. Though suspicious of her at first, Rosemary eventually warms to Melissa, requesting that Melissa teach her obscure words from the dictionary every time they see each other. At this point it is clear that Rosemary’s father’s harshly rational and clinical view of the world is not helping the family move on from Fern’s disappearance. While Rosemary’s father rejects psychoanalysis as “bogus,” he repeatedly engages in exactly the kinds of behaviors (denial, dishonesty, addiction) that psychoanalysis is designed to diagnose and treat. However, his scientific arrogance prevents him from being able to see this. One day, Rosemary is home alone with Melissa, who is watching a soap opera on TV. That same day, a friend of Lowell’s called Russell Tupman shows up in the Cookes’ driveway, smoking a cigarette. Rosemary “instantly” falls in love with him, and Lowell tells her to get in the back of the car, explaining that the three of them are going on “a secret adventure.” Rosemary sings along to the radio in the backseat until Russell tells her to stop. Eventually the car stops, and Rosemary realizes that they have arrived at their old house. Up until this point, she has assumed that Fern had stayed behind at this house, living with the graduate students. This thought does not trouble her, because the graduate students always loved Fern. Russell is the stereotype of teenage male deviance, and Rosemary (somewhat predictably) falls for his “bad boy” persona immediately. Meanwhile, Lowell’s explanation that they are going on a “secret adventure” is clearly sinister, yet Rosemary is too young and naïve to understand any of this. Her willingness to get into trouble in order to be liked foreshadows her relationship with Harlow, which is similarly defined by recklessness and rebellion. Feeling nervous, Rosemary protests that “Mary doesn’t want to see Fern”; Lowell replies with indignation that the house is empty. Lowell tells Rosemary to crawl through the dog door. When she hesitates, Russell tells her that they are counting on her, which persuades her to go in. Rosemary feels that the house is angry, and then sad. She mournfully remembers all the things about living there that she misses, and all the things she used to do with Fern. Russell asks Lowell if the front lawn is still electrified, but Lowell doesn’t know what he is talking about. Russell says there was a rumor that the lawn was electrified to keep people away. Eventually, Melissa realizes that Rosemary is missing, and she and Lowell are found and reprimanded by their parents. The detail of Rosemary climbing through the dog door again emphasizes her close connection to animals. Also, note that she feels that the house is “angry” and “sad.” Rosemary has a tendency to anthropomorphize (ascribe human qualities to) nonhuman animals and things, and it is clear that—especially at this young age—she does not yet have a solid grasp on what distinguishes humans from the rest of the world. The rumor about the electric fence further proves that Rosemary’s family is notorious in the neighborhood, but is not yet clear for what reason. 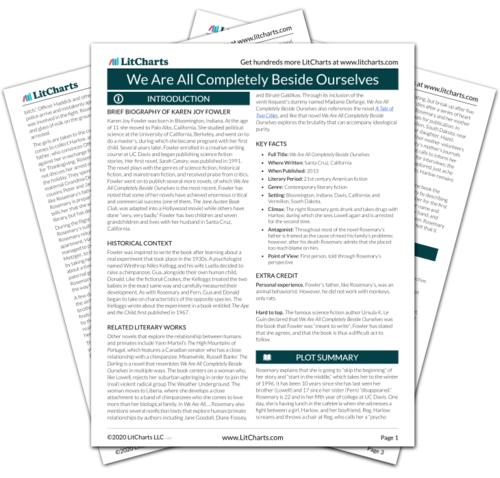 Get the entire We Are All Completely Beside Ourselves LitChart as a printable PDF. Seresin, Indiana. "We Are All Completely Beside Ourselves Part 2, Chapter 4." LitCharts. LitCharts LLC, 21 Sep 2017. Web. 24 Apr 2019. Seresin, Indiana. "We Are All Completely Beside Ourselves Part 2, Chapter 4." LitCharts LLC, September 21, 2017. Retrieved April 24, 2019. https://www.litcharts.com/lit/we-are-all-completely-beside-ourselves/part-2-chapter-4.